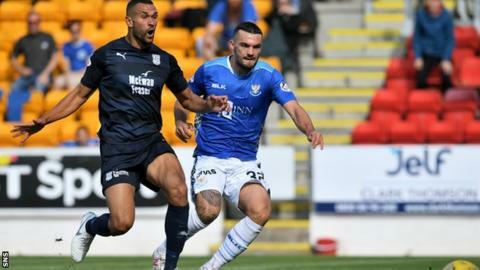 St Johnstone striker Tony Watt is targeting a Scotland recall after winning the Scottish Premiership player of the month award for August. The former Celtic, Hearts and Charlton forward, 24, has scored six goals in nine games since joining Saints in July, including four last month. His sole Scotland cap to date came under Gordon Strachan as a substitute against Czech Republic in March 2016. "I want to get back in the squad," he told St Johnstone's website. "It is part of my ambition because you want to be playing for your country. "This one [the squad for forthcoming games against Belgium and Albania] came around too quickly but if I can consistently do it for months then who knows, maybe I can get back in." As well as Premiership strikes against Hibernian and Dundee last month, Watt also scored twice in a League Cup win against Queen of the South, which secured Saints a quarter-final against his old club Celtic on 26 September. "That will be good," he added. "It is going to be hard and it might not be good on the night with all the running we need to do. "But we will have a game-plan and hopefully we can give them a game. We go into every game expecting to win." Watt acknowledged the influence of Saints manager Tommy Wright as he vowed to maintain the renaissance his career has enjoyed so far in Perth. "The manager has been brilliant," he added. "He is the reason I came here. He has given me bits of advice and coaching that he needs me to do, and has helped my game massively. "You have always got a point to prove in football and hopefully I can keep this up and score as many goals as possible." St Johnstone's next league matches are at home against Aberdeen on 15 September away at Rangers on 23 September.